Tag Archive | "Spotted African Lungfish (Protopterus dolloi)"
The Spotted African lungfish (Protopterus dolloi) is also referred to by tropical fish keeping enthusiasts as the Slender Lungfish and is found in middle Africa, the lower Congo River, the Kouilou-Niari, and the Ogowe River basins. Spotted African Lungfish live in the temporary floodplains, riverbeds, swamps, marshes, and backwaters of the above basins and during spawning season can be found in open water. These lungfish have the eel like body that all species posses and are generally brown in color. Juveniles have black spots spattered throughout the entire body which are lost as they become adults. Like all Protopteridae species, they are capable of aestivation however, this species generally does not aestivate. Adult Spotted African Lungfish require a large aquarium of at least 100 gallon capacity. Juveniles can be housed in a smaller aquariums but will eventually outgrow their accommodations. Because lungfish are not very active, they only need enough room in their tank to move around freely. 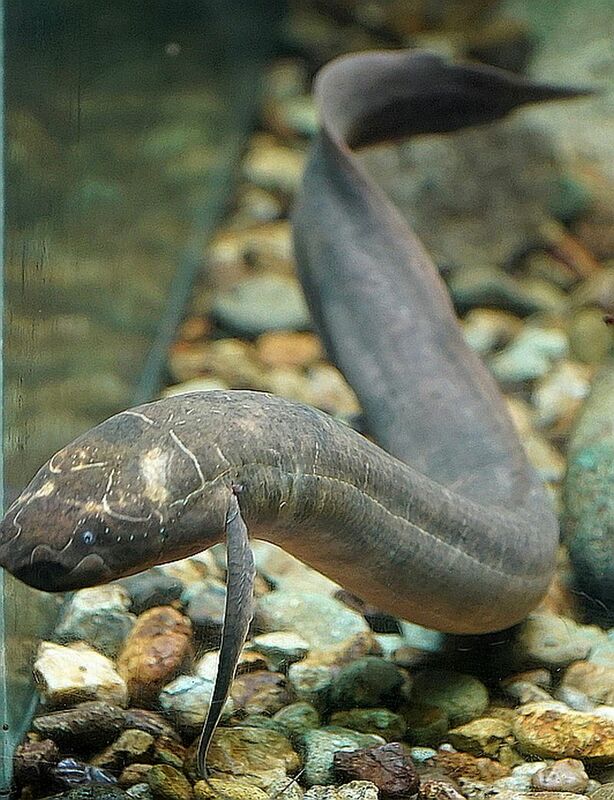 Spotted African Lungfish are best kept in a single species tank with a mud, sand, or very fine gravel substrate. Except for keeping water movement to a minimum, they are not very fussy about their accommodations. A few aquatic plants, some driftwood roots and smooth rocks for them to hide among is all that is required, but since they are “escape artists” they should have a tightly fitting cover over their tank with enough of an air gap for them to surface for atmospheric oxygen when they need to breathe. They also prefer a dimly lit tank. 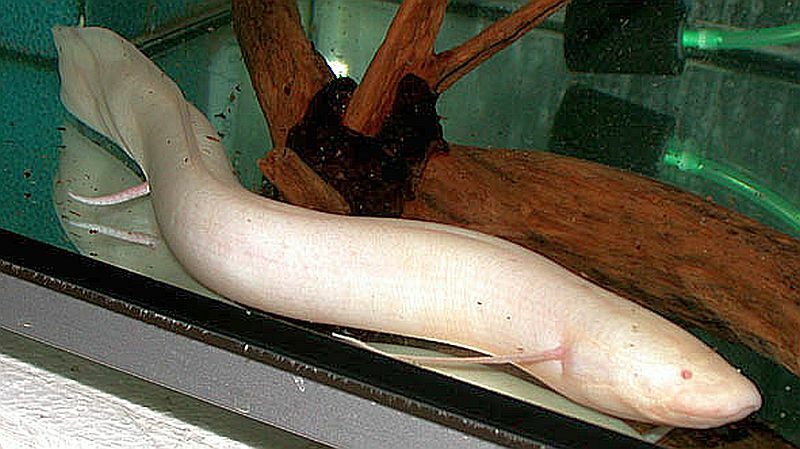 Lungfish are messy eaters and although they are tolerant of a wide range of water parameters, an outside canister filter should be used to keep their water clean to minimize the possibility of disease. Spotted African lungfish have not been bred in captivity and there is no external difference between sexes. In their natural habitat their nests can be found during the breeding season from June through October, which coincides with the rainy season. Like the Marbled Lungfish (Protopterus aethiopicus) the males dig a nest in the mud and line it with aquatic vegetation. After the females deposits her eggs and the male fertilizes them, the male will guard the eggs and later the fry, until they lose their gill like appendages and become air breathing. The females normally play no role in the rearing the young and move into open water after the eggs are deposited. Protopterus dolloi are omnivorous and in their natural habitat feed on invertebrates, fish, worms, amphibians, and vegetable matter. In an aquarium environment they will eat a variety of foods such as mussels, clams, prawn, shrimp, fish, earthworms and vegetable matter. Most will adapt to eating algae wafers and other prepared foods but adults should be fed a diet of fish. Spotted African Lungfish should be fed twice a day as juveniles and only a couple of times a week as adults. They do not need food on a daily basis once they become adults. Although Protopterus dolloi are easy to keep and extremely hardy, they are only recommended for intermediate to advanced tropical fish keeping enthusiasts. They are longlived and have a lifespan of over 20 years, so a commitment must be made prior to purchasing this species to keep them for an extended period. Slender Lungfish are available from specialty fish shops and over the internet at modest to high prices. Their availability is usually limited.